In short, the best reason to use us is because we strive to be the best! We are not in a resort or cruise ship where people come in once or twice and then leave. We rely on repeat clients and recommendations so we have to make sure every massage is great. 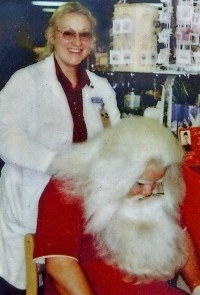 As you can see, even Santa uses us to get ready for Christmas. So whether it's the holidays, work, working out, or you just want to maintain a healthy life style, we can help you, too. We have been in the massage business serving the San Fernando Valley and surrounding areas for over 40 years! We know what works ...and what doesn't. There have been many fads, gadgets and gimmicks that have come and gone, but we are still here giving our clients the very best in massage therapy. Check out our Services and Specialties page, we offer many modalities and you can be confident that with our world-class therapists, you will not be disappointed.